Beijing literally means 'northern capital' (jing stands for capital). While all signs around you point to a city on the move... huge buildings of glass, steel, and concrete coming up on the roads from the airport, to the Great Wall and as you move to the industrial parks in the suburbs, you also see signs all around you that this city has a past. 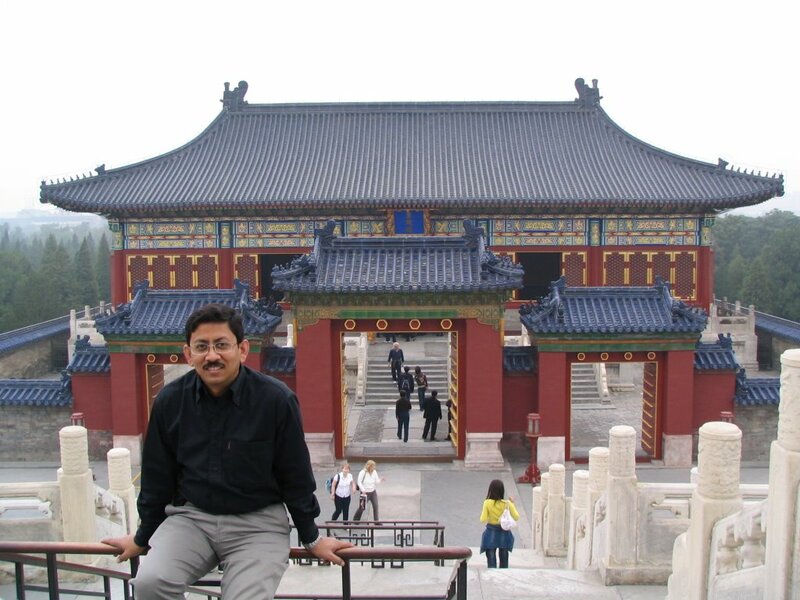 Beijing existed as a city almost all the way back to the first millenium B.C! The city has been burnt down and re-built several times during this period, mostly by the invading Mongols from the north. I tried to cram in as many sights and sounds of this exciting city during the four days I was here. Before I flew back, I was able to see the Llama Temple, Forbidden City, Temple of Heaven, and Tiananmen Square. 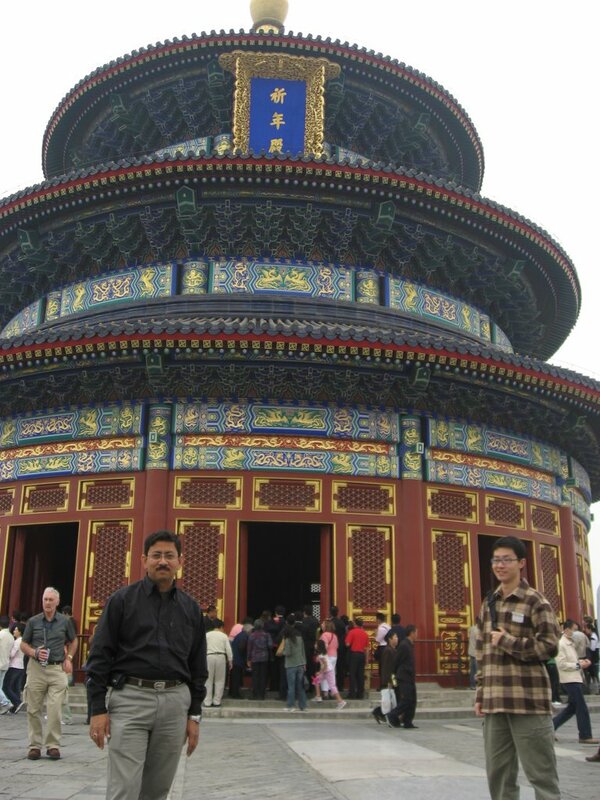 I thought the Temple of Heaven was really the best of the lot; intricately decorated structures, very peaceful place, and a huge garden all around with lots of greenery. Another thing one notices in the old Chinese relegious artifacts (the original relegion, Daoism or Taoism pre-dates the other modern religions of China such as Buddhism by many years) is the similarities with some Indus Valley and Egyptian ones as far as their gods are concerned. They are mostly combinations of different animals in one, such as a dragon-faced horse; they also have artifacts of the Mother Goddess, common to all these religions. I wasn't too impressed by the Forbidden City, from which almost ten emperors ruled China. It's like one of our palaces in India (of course, architecturally quite different); currently it houses museums from the dynasties that ruled here). This can easily consume 2-4 hours of your time depending on your interest level. BTW, Much of the Forbidden City is under renovation right now (probably in preparation for the 2008 Olympics). Our most fun experience was the shopping and haggling to get to the right price... well, actually you never quite can figure out the right price. That leather Gucci handbag for US $8... too expensive? How about an Geogia Armani leather belt for US $5... hmm... And btw, these aren't cheap looking imitations. The quality and workmanship are good, and they look like the real things. Ate at a awesome place in the Grand Hyatt. 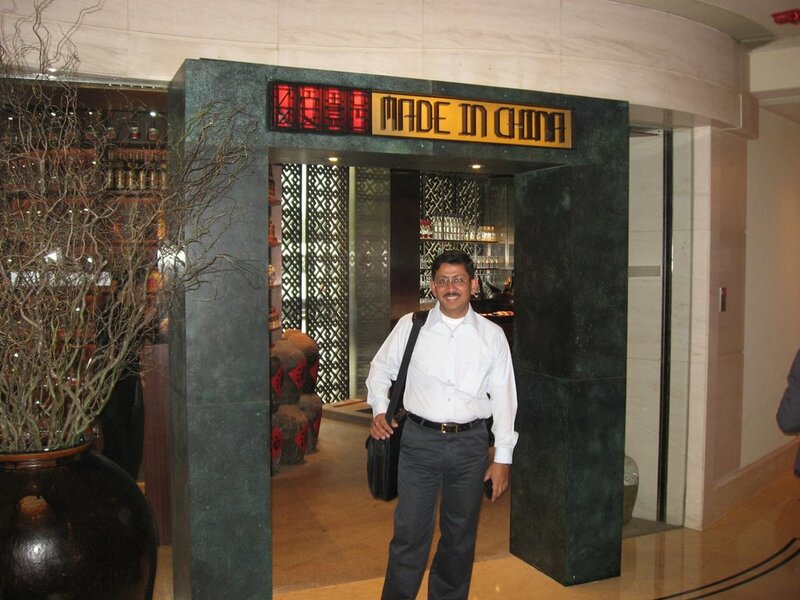 The restaurant is called Made in China, and has been rated the best place to eat in all of North East China. Splendid ambience, food, and service. The restaurant serves contemporary Chinese cooking... please note that their specialities, Peking Duck and Beggars' Chicken have to be ordered in advance when making reservations (at least a few hours in advance; they get sold out quick!). Multiple show kitchens, innovative presentation and a great wine selection complete the experience.